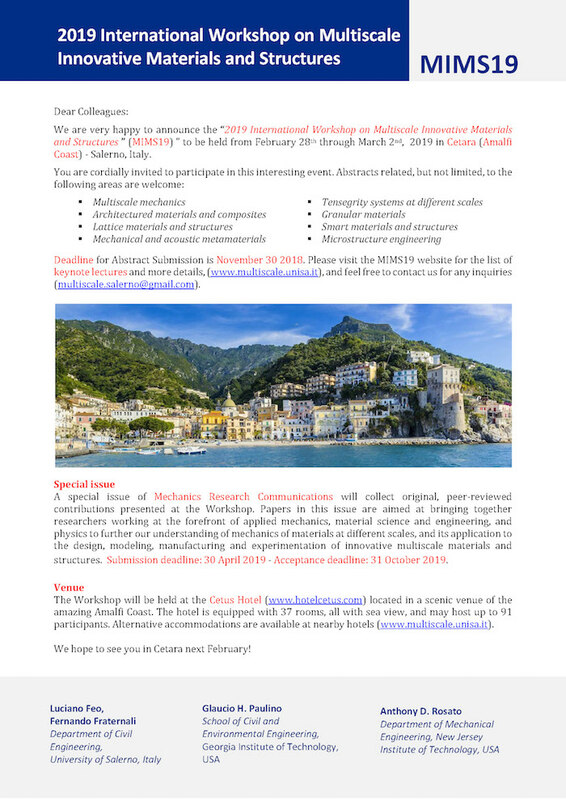 We are very happy to announce the "2019 International Workshop on Multiscale Innovative Materials and Structures" (MIMS19) to be held from February 28th through March 2nd, 2019 in Cetara (Salerno), Italy. 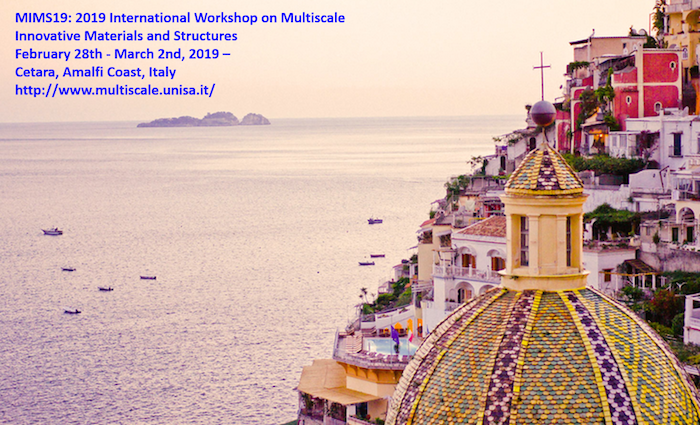 The Workshop will be held at the Cetus Hotel located in a scenic venue of the beautiful Amalfi Coast (video). Raffaele Barretta, University of Naples "Federico II": "Recent achievements in nonlocal elasticity and applications to nanostructures"
Davide Bigoni, University of Trento: "Slip surfaces, shear bands, and the dynamics of flexural lattices"
Stéphane Brûle, Menard Group - Institut Fresnel, "Perspectives for seismic metamaterials in earthquake engineering"
Fernando Fraternali, University of Salerno: "Novel acoustic applications of tensegrity structures"
Howon Lee, Rutgers University: "Micro 3D printing for tunable mechanical metamaterials"
Glaucio H. Paulino, Georgia Institute of Technology: "Origami engineering: configurational metastructures and metamaterials"
Siegfried Schmauder,University of Stuttgart:"Multiscale Materials Modeling: New Developments with Special Emphasis on MD-Simulations"
Gennaro Senatore, Swiss Federal Institute of Technology (EPFL):" Synthesis and experimental testing of minimum energy adaptive structures"
Robert E. Skelton, Texas A&M University: "Tensegrity approximations in continuum mechanics"
Patrizia Trovalusci, University of Rome "Sapienza": "Discrete to scale dependent (non-classical) continuous approaches for materials with microstructure: theoretical and computational issues"
The meeting room, the terraces and the banquet halls of the scenic Hotel Cetus will host the scientific and social activities of the Workshop. 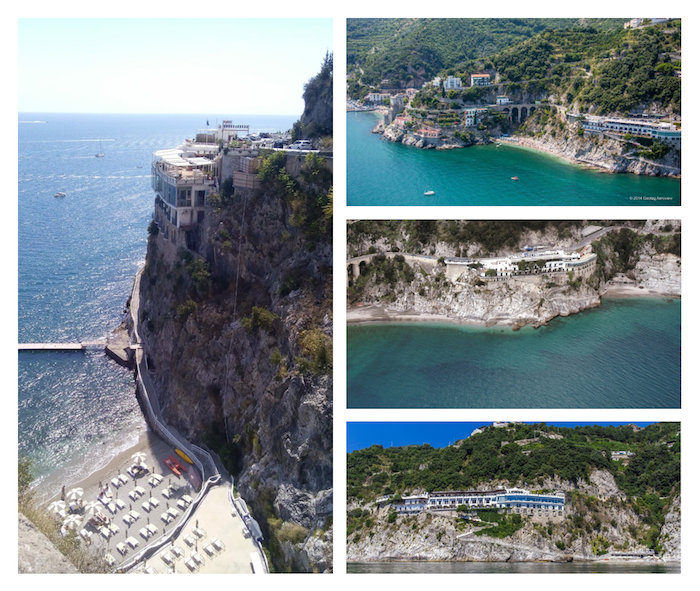 Standing on a sheer cliff that overlooks an enchanting bay, the Cetus Hotel is located only 300 meters from Cetara, a historic fisherman village, and offers a striking view on the Amalfi Coast. The elegant décor and refined atmosphere is inspired by the tradition of Vietri ceramics. The hotel is equipped with 37 rooms, all with sea view, air-coditioning and internet wi-fi, and may host up to 91 participants. It also offers a private beach, set in an enchanting almost shell-shaped bay, wellness and fitness centers. Transportation services allow access to daily shuttles from/to Salerno. Accommodation at Cetus for two nights is included in Full Registration Fees. See also the following video. Alternative accommodations are available at nearby hotels. Transportation services included in basic and full registration fees allow access to daily shuttles from/to the Airport of Naples and the hotels listed on the dedicated webpage.